One of the things that I find most fascinating and engaging about videogames is their capacity to serve as interactive thought experiments. Games can be ways of making explicit (or more often implicit) arguments, ways of trying to understand the past, or even ways of getting players to reflect upon the present. As such, I tend to enjoy games that experiment with new mechanics and new ways of looking at existing problems. In an industry that tends to focus on polish and incremental improvement, this isn’t always as common as you might think. While genre conventions help to create specialized systems of meaning, allowing players’ skill at one game transfer to another and thereby target existing audiences, they also canonize certain mechanics to the exclusion of others. For this reason, despite greatly enjoying highly polished modern games like Civilization V or Mario Kart 8, I frequently find myself playing quirky indie games or old DOS games on a more regular basis. One of the games that I’m constantly turning to as an example (both here and at Play the Past) is Master of Orion, a turn-based strategy game released in 1993. 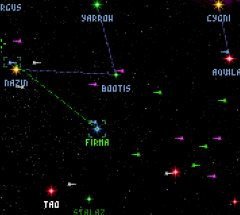 Although almost certainly influenced to some degree by earlier strategy games like Civilization (not to mention being highly influential to many later games), the original Master of Orion was created before many of the conventions of the genre were firmly established. For example, Master of Orion eschews the standard Civ-style tech tree, one of the most fundamental elements of the genre, for its own unique technology system. Although less intuitive for many players, this system is, in many ways, a much more interesting way of thinking about technological development. The science fiction setting of Master of Orion is also a major factor in its departure from other strategy games. While games based on historical settings have to worry about conforming to players’ expectations and understandings of history (or risk provoking endless Internet arguments over whether or not a spearman should be able to destroy a tank), games set in a hypothetical future allow a great deal more creativity on such matters. The upside is that this lack of context enables innovative solutions, such as Master of Orion’s technology system. The downside is that while fantastic elements like Gatling lasers and terraforming are fun, they are rarely have relevance to the present. Of course, sometimes the present surprises you. While China certainly isn’t the first to engage in land reclamation in the South China Sea (Vietnam, for instance, had been increasing the size of West Reef and Sand Cay for several years), the scope of their operation far surpasses that of any other nation in the region. Perhaps more troubling to other claimants in the Spratlys, however, is the nature of China’s operations. Whereas other nations have made small increases to islands that were already occupied and had substantial permanent structures, China is creating massive islands out of completely (or almost completely) submerged reefs. By occupying territory that was previously considered uninhabitable (or at least legally unclaimable), China has grabbed a number of strategically important locations and made any attempt at drawing international borders considerably more difficult. This unconventional form of expansionism is unprecedented, especially in peacetime. China has previously asserted its territorial clams in the nearby Paracel Islands, but this took the form of more traditional military force. In contrast, China’s recent expansion into the Spratly Islands has thus far been non-violent, relying on technological means to expand their territory. Although this situation has no obvious parallels in recent military history, this situation should seem very familiar to anyone who has played Master of Orion. It also highlights one of the unique game mechanics that sets Master of Orion apart from more conventional strategy games. In games like Civilization, the expansion phase occurs at the very beginning of the game. Once a player has pushed her borders out until they meet those of her neighbors, there is no other way to push those borders further short of force. This zero-sum game is how we normally think of international politics. In Master of Orion, however, most players only possess the technological ability to colonize half of the planet types at the start of the game. In order to colonize these more hostile planets, players must develop more advanced planetology techniques. 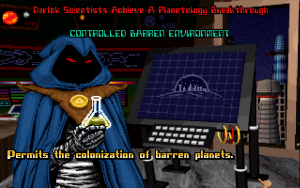 This means that players spend much of the game with uninhabitable planets sitting idle in strategic locations or even within their own borders. Thus, a player with an edge in planetology technology can swoop in and colonize a planet that had essentially been worthless to the other factions, terraforming it into a valuable strategic location. So if we use Master of Orion as a way to think about the Spratly Islands in the same way that we use Civilization or even Chess to think about more traditional confrontations, what kinds of conclusions might we draw? Perhaps the most obvious effect of such aggressive planet (or island) grabbing is an extreme strain on diplomatic relations, which has already been seen as perhaps the most immediate effect of China’s island building campaign. In Master of Orion, this situation is usually only aggravated with the movement of ships and personnel throughout the disputed territory. I also think that it’s probably safe to say that the situation in the South China Sea will likewise become even more complicated once the airstrips and defensive positions on their islands are completed and the movement of ships, planes, and troops begins to increase. It’s also difficult to see a peaceful resolution to this tension unless one side decides to abandon their position in the island chain completely. Another issue that is often overlooked in the Spratly island conflict is ecology. 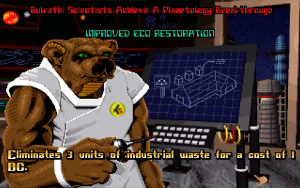 In Master of Orion, ecology is a major focus of the game. Ecology is one of the five areas in which planets can spend resources and of the six fields of research available to the player, one, planetology, is almost exclusively focused on ecological issues such as waste cleanup and terraforming. While a player has the option to ignore ecological concerns and channel those resources toward military or industrial projects, such trade-offs are rarely beneficial, even in the short term. Industrialized planets can generate massive amounts of pollution, and the buildup of this industrial waste can reduce the habitability of a planet, even killing off its population if the pollution becomes too extreme. For this reason, focusing research on planetology is just as important to the player as researching weapons or propulsion. A healthy empire requires healthy planets. 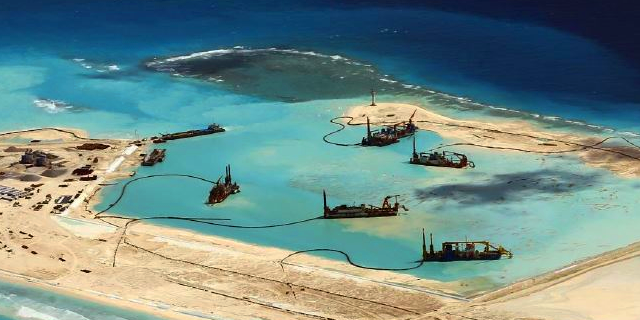 While China’s island building will make these locations more useful for military and civilian purposes, the process not only buries the former reefs under thick layers of sand and concrete, but also fills the surrounding waters with the thick sediment that accompanies the dredging process. Considering the great biodiversity present in the reefs of the Spratly Islands, the ecological damage could have devastating long-term effects on marine life in the Spratlys and in surrounding regions. This directly impacts many Southeast Asian countries that depend heavily on fish from the South China Sea to feed their populations. Since one of the primary benefits for China of laying permanent claim to the Spratly Islands would be the extension of their Exclusive Economic Zone, which would grant them exclusive rights over natural resources like fish and oil, even a successful takeover of the region could prove to be a Pyrrhic victory if measures aren’t taken to protect biodiversity and restore reef habitats. Of course, looking at the Spratly Islands conflict through the lens of Master of Orion is only one way of looking at it, but it’s a different way of looking at the situation than we would get through many modern games. It’s also one reason why I enjoy games that depart from the standard design formula and do things differently. They give us new ways of thinking about the world and a broader vocabulary with which to discuss it. 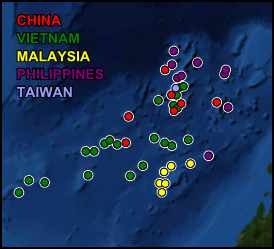 South China Sea photographs from Asia Maritime Transparency Initiative.